Matt Young joins his SFS colleagues for chamber music by Spohr, Brahms, and Faure at Davies Hall. For more information click HERE. ESF featured at a private event for members of the Metropolitan Club, a women’s club founded in 1915. Music in May’s 12th anniversary season features ESF, alongside Jennifer Koh and Variation Trio. Elizabeth, Jonah, and Rebecca will perform Dvorak “Dumky” Trio. Tickets are available HERE. Music in May’s 12th anniversary season features ESF alongside Jennifer Koh and Variation Trio. Elizabeth, Jonah, and Rebecca will perform Lili Boulanger’s “D’un soir triste”. Tickets are available HERE. Rebecca, Matt, and Jonah perform Beethoven and Dohnanyi on this free community concert series sponsored by The Museums and Cultural Arts Commission. Space is limited for these concerts and reservations are required. Call 831-646-5640 to reserve your seat! 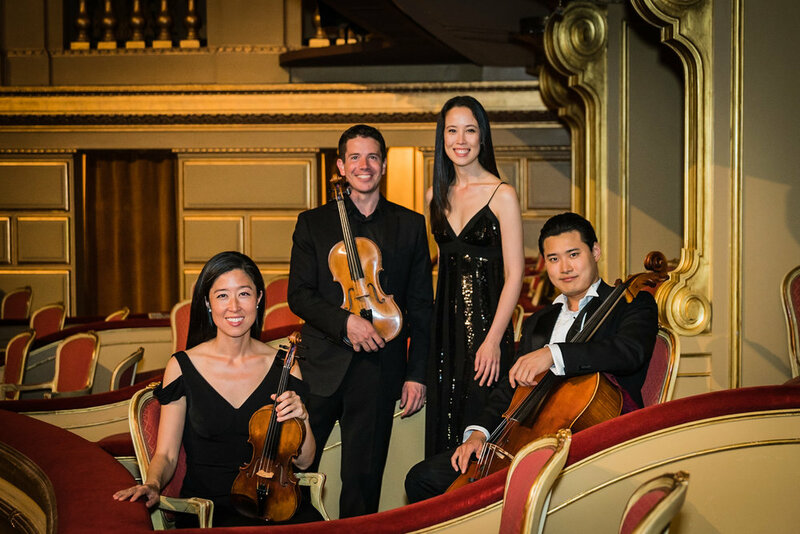 Piedmont Piano Company presents the seventh annual free chamber music concert featuring members of San Francisco Ballet Orchestra including Jonah Kim and Rebecca Jackson. The program includes Poulenc Flute Sonata, Prokofiev's quixotic Quintet for Winds and Strings, a Horn Duet of Dvorak, Bach's majestic Brandenburg Concerto No.3, and more! This event typically sells out so RSVP is a must. Elizabeth Jackson, Rebecca Jackson, Matt Young, and Angela Lee perform for incarcerated youth at Santa Cruz Juvenile Hall. A fixture in the SF classical music scene since 1970, Old First Concerts presents ESF featuring principal clarinet of SF Opera, Jose Gonzalez Granero. Come hear his award winning string quartet, a sextet for clarinet, strings and piano by Sheridan Seyfried, and Faure's G Minor Piano Quartet. Tickets available HERE. Elizabeth, Matt, Jonah, & Rebecca perform at the Adult Day Program at the Irene Swindells Center For Adult Day Services, which is part of Institute on Aging. The program is a day care for participants living with conditions such as Alzheimer’s related dementia, Parkinson’s, and stroke. Rebecca, Matt, Jonah, and Elizabeth bring holiday cheer to homeless families at the Raphael House, an organization founded in 1971 that helps at-risk families achieve stable housing and financial independence. Their success rate is unmatched: more than 85% of all Raphael House families go on to achieve long-term housing and financial stability. ESF performs at the Maybeck Studio for the Performing Arts, a small performance space located in a private home in the Berkeley hills. Built in 1914 by Bernard Maybeck, the studio has a rich tradition of musical performances dating back over 100 years. Admission ($30 general) will be taken at the door. Seating is limited. Get your required online reservation HERE to guarantee your seat. Don't miss this Opus 415 event, an intimate Friendsgiving gathering at an iconic North Beach gallery in support of Ensemble San Francisco. Nosh, mingle, enjoy a performance by ESF’s piano quartet (Elizabeth Schumann, Rebecca Jackson, Matt Young, and Jonah Kim), and partake in a side by side reading party with ESF. Drinks and hors d'oeuvres will be served. Opus 415 is the social club of ESF that fosters friendships with our audience. Rebecca, Matt, and Jonah will perform for the homeless families served at the Raphael House, an organization founded in 1971 that helps at-risk families achieve stable housing and financial independence. Their success rate is unmatched: more than 85% of all Raphael House families go on to achieve long-term housing and financial stability. Matt, Jonah, Rebecca, and Elizabeth perform at De Marillac Academy, Located in the heart of San Francisco's Tenderloin Neighborhood, the Academy unites philanthropists with low-income families to break the cycle of poverty through education. Matt, Jonah, and Rebecca perform at TECA (Thomas Edison Charter Academy), a public non-profit K-8 that serves low income student in the San Francisco Mission. Elizabeth, Rebecca, Matt, and Jonah perform Schumann Piano Quartet at 5:50pm as part of the 10th anniversary of SF Music Day, one of the Bay Area’s top free music festivals, located in downtown San Francisco. Four stages featuring 36 local ensembles and 160 musicians, the schedule runs from 12-8pm. For more info and to register, click HERE. Join Elizabeth Schumann, Rebecca Jackson, Daniel Stewart, and Jonah Kim in Mill Valley as they perform Schumann Piano Quartet at the intimate Tivoli in Throckmorton Theatre. Wednesday Noon Concerts are offered complimentary to the community each week from September through July. ESF performs at the Adult Day Program at Institute on Aging. The program is a day care for participants living with conditions such as Alzheimer’s related dementia, Parkinson’s, and stroke. Santa Cruz Symphony's opening Recital will feature their principal harp, Madeline Jarzembak. She will be joined by Jonah Kim and Rebecca Jackson for trios by Jacques Ibert and Joseph Haydn. Click HERE for tickets and information. Enjoy the vineyards of Napa Valley and catch Matt Young featured on the festival's August 25th and 26th programs. Find out more about this and all the other concerts HERE. A FREE community chamber concert in collaboration with the San Francisco Symphony and funded by the Irvine Foundation. The performance features Matt Young and other members of San Francisco Symphony. The concert is followed by a question and answer session with the musicians. Space is limited so register HERE. ESF presents Brahms' Piano Quintet at a home in SF.